click23 had the most liked content! I had 3 three scenarios in my head going into this last night as possible out comes of the board Ã¢â‚¬â€¹He declared himself an atheist - we would have denied advancement He was still unsure of his beliefs - we would have postponed his board to give him more time to think He declared himself a faithful believer in some faith - we would have granted advancement In the end, he was somewhere between 2 and 3. Still unsure, but has a Protestant Christian background and that is influencing his beliefs, or maybe "want to believe" would be a better fit. He expressed a belief a "God" but was unsure what that meant, and wants to find something to believe in, and is actively searching. In the end he was granted advancement to Eagle. He was very well prepared for the board and handled it quite well. I truly believe he is going through a rough time in his faith, and just trying to figure things out. Below is what the EBOR will be reviewing before we meet with the Scout. The issue at hand tonight is whether the scout has completed Eagle Scout requirement #2 and membership requirement of subscribing to the Declaration of Religious Principle Eagle Scout requirement #2 Demonstrate that you live by the principles of the Scout Oath and Scout Law in your daily life. The 12th point of the Scout Law, a Scout is reverent. The Boy Scout of America defines reverent as: Ã¢â‚¬Å“He is faithful in his religious duties and respects the convictions of others in matters of custom and religion.Ã¢â‚¬Â A Scout must demonstrate that his lives by the Ã¢â‚¬Å“duty to GodÃ¢â‚¬Â point of the Scout Oath. The Boy Scout of America defines Ã¢â‚¬Å“duty to GodÃ¢â‚¬Â as: Ã¢â‚¬Å“Your family and religious leaders teach you about God and the ways you can serve. You do your duty to God by following the wisdom of those teachings every day and by respecting and defending the rights of others to practice their own beliefs.Ã¢â‚¬Â A Scout must demonstrate that his lives by a portion of the Ã¢â‚¬Å“morally straightÃ¢â‚¬Â point of the Scout Oath. The Boy Scout of America defines Ã¢â‚¬Å“morally straightÃ¢â‚¬Â as: Ã¢â‚¬Å“To be a person of strong character, your relationships with others should be honest and open. You should respect and defend the rights of all people. Be clean in your speech and actions, and remain faithful in your religious beliefs. The values you practice as a Scout will help you shape a life of virtue and self-reliance.Ã¢â‚¬Â Excerpt from the Declaration of Religious Principle, taken from the Youth Application Ã¢â‚¬Å“The Boy Scouts of America maintains that no member can grow into the best kind of citizen without recognizing an obligation to God and, therefore, recognizes the religious element in the training of the member, but it is absolutely nonsectarian in its attitude toward that religious training. Its policy is that the home and organization or group with which the member is connected shall give definite attention to religious life. Only persons willing to subscribe to these precepts of the Declaration of Religious Principle and to the Bylaws and codes of the Boy Scouts of America shall be entitled to certificates of membership.Ã¢â‚¬Â I think it is important to first remind ourselves of the Scout Law, especially the helpful, friendly, courteous, and kind points. We need to keep the board lighthearted feeling of the board that we always try to project, but at the same time keep in mind the seriousness of the issue at hand. Taking into account the points of the Scout Law listed above, we should be as helpful to the Scout as possible. We all have taken the Scout Oath, which requires us to Ã¢â‚¬Å“help other people at all times.Ã¢â‚¬Â I believe this should include us doing everything to help this Scout advance, within the policies of the BSA. I believe that we should allow the scout more time to examine and explore his beliefs if needed. Our personal beliefs must stay out of the conversation during the board, it is about the Scout and if he has completed the requirements and meets the membership standard. While the policies of the BSA repeatedly refer to God, the BSA has left defining this to the scout and his family. The BSA has a history accepting faiths that do not have a God, such as Buddhism. Buddhism does not believe in a God, but is considered a religion or faith. The BSA recognizes its religious emblem, and Buddhist temples chartered 69 units in 2013. Other examples recognized by the BSA include Jainism, that believe there is no God, and Hinduism in which followers may or may not believe in a God. What I am trying to get at his that the BSA has a history of accepting Scouts that do not have a belief in a God per se, but have a religion or belief that they are faithful to, as long as they do not label themselves atheists. Any last advice, we are reconvening the EBOR tonight. Latest news from their Facebook page: The National Executive Board approved expanding the STEM Scouts test pilot into additional councils! In the coming days, we will have a great deal more information to share. This happened last week, from what I understand there will be 10 councils that this program will be rolling out to this year. From what I understand the BSA is moving away from PowerPoint presented training, and to more of an instructor focused training. You need to refer to Guide to Advancement, the BSAs advancement rule and policy book, particularly section 7 which covers the merit badge program. http://www.scouting.org/filestore/pdf/33088.pdf First, the Scoutmaster is out of line with requiring that a scout be a third year Scout. The GTA is quite clear on the matter of adding to the requirements. No council, committee, district, unit, or individual has the authority to add to, or subtract from, advancement requirements. You really need to review topics 7.0.0.3 and 7.0.4.7 in the GTA. No where in the GTA does it say that a Scoutmaster can withhold an Application for Merit Badge, AKA Blue Card. Since the counselor was registered and the activities were properly supervised then I would suggest that the young man be awarded the merit badge. He made a good faith effort to contact the Scoutmaster, and other than getting it the merit badge application signed off by the Scoutmaster to start with, everything was done correctly. I hope the Scoutmaster did not call the boy back to simply deny a Blue Card by inaction. 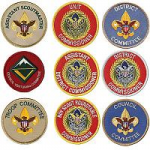 If the scoutmaster and committee do not budge, I would recommend sending in a Reporting Merit Badge Counseling Concerns from, 11.1.0.0 in the GTA, to the council advancement committee. Two articles to read from the Scouting Magazine Blog would be http://blog.scoutingmagazine.org/201...e-card-issued/ http://blog.scoutingmagazine.org/201...equirement-10/ Below is a quote from the second link by the head of the National Advancement Team of the BSA: Unit leaders do not have the authority to refuse to give a Scout a blue card. Ã¢â‚¬â€¹The signature on a blue card signifies, simply, that the unit leader has had a discussion about the badge with the Scout and that the Scout has been provide the name of at least one registered and approved counselor. We are taking the approach that a Scout is helpful, friendly, courteous and kind, and that a Scout will help other people at all times. We are willing to do everything possible to see this young man get his Eagle, within the policies of the BSA. When we reconvene we will ask questions such as those I previously posted. If he stands firm in his previously stated beliefs, he will not advance. If is wavering, we will give him time to think things out. If he has "came to Jesus"(just an expression, any God would be acceptable), we would postpone the board once again, to give him time to demonstrate that he can live by the Scout Oath and Law before he turns 18. Fred, he was very firm in no belief in God, higher power, FSM or anything. For me there are two key points. The first is has he completed Eagle rank requirement #2? It states, Ã¢â‚¬Å“Demonstrate that you live by the principles of the Scout Oath and Scout Law in your daily life.Ã¢â‚¬Â 12th point of the Scout Law, a Scout is reverent. The Boy Scout of America defines reverent as: He is faithful in his religious duties and respects the convictions of others in matters of custom and religion [*]He must demonstrate that his lives by the Ã¢â‚¬Å“duty to GodÃ¢â‚¬Â point of the Scout Oath. The Boy Scout of America defines Ã¢â‚¬Å“duty to GodÃ¢â‚¬Â as: Your family and religious leaders teach you about God and the ways you can serve. You do your duty to God by following the wisdom of those teachings every day and by respecting and defending the rights of others to practice their own beliefs. [*]He must demonstrate that his lives by a portion of the Ã¢â‚¬Å“morally straightÃ¢â‚¬Â point of the Scout Oath. The Boy Scout of America defines Ã¢â‚¬Å“morally straightÃ¢â‚¬Â as: To be a person of strong character, your relationships with others should be honest and open. You should respect and defend the rights of all people. Be clean in your speech and actions, and remain faithful in your religious beliefs. The values you practice as a Scout will help you shape a life of virtue and self-reliance. The second point is does he meet the membership standards of the BSA which state: Membership in any program of the Boy Scouts of America requires the youth member to (a) subscribe to and abide by the values expressed in the Scout Oath and Scout Law, (b) subscribe to and abide by the precepts of the Declaration of Religious Principle (duty to God), and © demonstrate behavior that exemplifies the highest level of good conduct and respect for others and is consistent at all times with the values expressed in the Scout Oath and Scout Law. With his statements, I am questioning whether he is eligible for membership, and therefore advancement, per clauses (a) and (b). If he has not completed requirement 2 or he does not meet the member standards of membership, he will not advance to Eagle. Can we please get back on topic. qwazse listed a few good questions to go over with the young man. With those and some I have came up with, I have this: What is morality? Where do your sense of morals come from? What dictates what is right and wrong? How important is it to you that the best explanation for all things excludes intervention from a higher power? Do you believe it is possible to believe in science and a higher power? Where did we call come from? Where did that come from? EtcÃ¢â‚¬Â¦.. How important is it to ensure another person's practice of religion as he/she sees fit? What does Ã¢â‚¬Å“duty to GodÃ¢â‚¬Â mean to you? Do you think that you live up to the Ã¢â‚¬Å“duty to GodÃ¢â‚¬Â and Ã¢â‚¬Å“morally straightÃ¢â‚¬Â points of the Scout Oath? Do you think that you live up to the 12th point of the Scout Law, a Scout is reverent Why do you think that the Boy Scouts have these principals? Have you ever been asked about you duty to God in your troop? Would you defend the right of other to practice as they see fit? What do you think of others pursuit of religion? How do you respect the religious convictions of other people? Why would you want an award from an organization that has an oath that requires you to do your best to do your Ã¢â‚¬Å“duty to God"? Are you aware that in the Boy Scouts of America the definition of God is left up to you and your parents? Do you think that you meet the membership standard of the BSA? What other questions would you guys ask? We asked him a few more questions about the issue, and then moved on to other topics. T2E, while all of the board members are protestant Christians, we are all aware of the BSAs requirements of faith in the DRP, Guide to Advancement, and its definition of reverent. We are only looking for an answer that satisfies the BSAs requirements nothing more, and nothing less. The answers you gave would be perfectly acceptable to us for the purposes of the EBOR. If this young man comes to realize that he believes in something, it is not our place to grill him on those beliefs, but it is our job to ensure that he has done his duty to God, and that he is reverent, as defined by the BSA. I think the easiest way to find out is to simply ask him if he thinks he has as a scout is trustworthy. qwazse, thanks for the advise. I am willing to let this go as long as I can, assuming he is willing to do some soul searching on his beliefs. But if he is steadfast in his denial of a belief, that is a different story.